The online debate over Brett Murray’s satirical painting of President Jacob Zuma has reached more than 108 million people, more than twice the entire SA population, and generated the equivalent of about R25 million worth of advertising. This is according to analysis done by online reputation management company BrandsEye on Tuesday. ”These figures are extremely high, compared to the ANCYL disciplinary hearing, which generated just under R2 million worth of online coverage,” Tarryn Walker, BrandsEye CEO said. According to the analysis 43,470 people expressed their opinions using a number of social media platforms. Three quarters of the comments originated from short social media service Twitter.com. Walker said conversation volumes climbed over the last few days with sentiment changing dramatically as the situation unfolded and opinions disseminated. The first spike in conversation was seen on Thursday with 794 mentions. As news spread about the controversial painting, volumes grew to 6,044 mentions on Friday. These numbers, which are expected to keep increasing, are now just shy of 45,000 mentions, the volume that the state of the nation address received when Zuma delivered it in February. ”With over a million South Africans utilising Twitter to share their opinions and rally support, they undoubtedly create their very own social movements to empower. This could not be more evident in this case, as we have seen sentiment and themes changing on a daily basis,” Walker said. 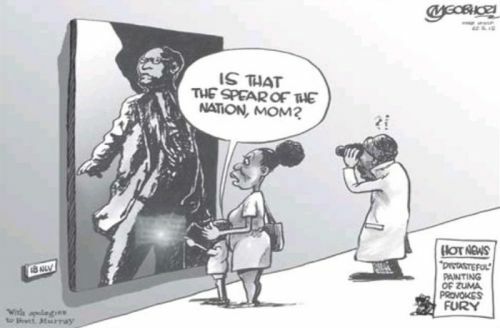 The BrandsEye analysis said that initial online conversation themes focused on the political content of the painting and the humiliation it caused Zuma. Discourse over the weekend focused on freedom of expression. On Monday, the online conversation was dominated by comments on racism with regard to the painting, as well as how far the country has actually come since 1994. Finally, Tuesday morning began with mentions of the legal actions the ANC was taking against the Goodman Gallery. This was interrupted by the painting’s defacement in the gallery which increased conversation by 50% from just over 4,000 to 6,574 mentions in an hour. Throughout the trend changes over the topic, #zumaspear has remained the most dominant hashtag - the means by which Twitter users mark a conversation topic. ”The initial spike in conversation came as no surprise, as people have a tendency to focus their attention on something that causes publicity and controversy. What’s been really interesting to see is how the public have leveraged this story to talk about the issues lingering under the surface in our society,” Walker said.